Kindercity is the place to visit for playing with science. It is a perfect combination of fun and knowledge for children of all ages. Sandrine and Jean Christophe Gostanian have been able to run the Kindercity as a private organization, which is very admirable. They advocate for STEM skill education and focus on early childhood understanding of technology and natural sciences. Today the Kindercity stands on its 6’000 square meters with around 250,000 visitors per year. What is the Media Zone? The inauguration of the Kindercity Media Zone opened the world of learning about Networking and Communication. The Internet and its good and bad actor are introduced in a very simple way so that understanding is guaranteed. When you think about how to explain the Internet to a child who has been using the Internet and mobile phones with Internet Access for his or her entire life, it becomes clear that this is not such an easy task. They had help. Help from young apprentices from companies in the region supporting the Kindercity initiatives and activities. As such both sides were able to learn – they share their knowledge with children of all ages and learn how to explain technical topics like automation, robotics, energy and computing in an understandable way suited for their target group. Kindercity is the newest member of the Cisco Networking Academy in Switzerland. 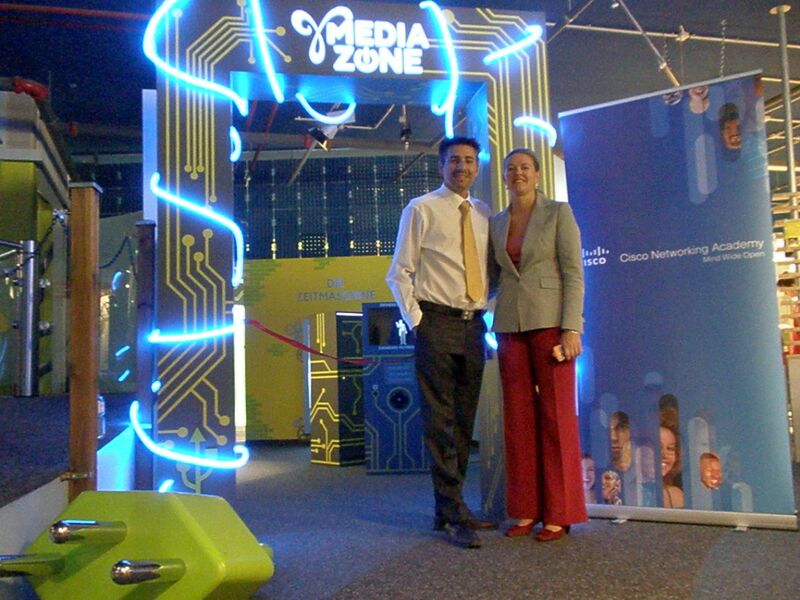 Cisco Switzerland supported the Media Zone exhibition with Internet Highway equipment. If you are interested in working with Kindercity or experience it as an innovative event location, Sandrine and Jean Christophe are always looking for more partners. By jjerlich in Europe, Switzerland on November 13, 2014 .